The M270 Multiple Launch Rocket System (MLRS) is comprised of the M269 Loader Launcher Module, the M993 chassis, and the Fire Control System (FCS). The M993 Carrier is a modification of the M2/3 Bradley Fighting Vehicle System (BFVS) chassis and is managed by the Tank-automotive and Armament Command (TACOM) located in Detroit, Michigan. The carrier is manufactured by United Defense Limited Partnership (UDLP), formerly FMC Corp. The system was originally produced in San Jose, California, but production was shifted to York, Pennsylvania in 1995. The M269 Loader Launcher Module is manufactured and assembled at Camden, Arkansas bythe Loral Vought Systems Corporation. The LLM comprises three major components: the cage, the turret and the base. The LLM is the actual housing and firing platform for theMLRS. The LLM also houses the fire control system (FCS) components and provideshydraulic power to operate the system's azimuth and elevation mechanisms. The LLM hasthe capability to perform self loading and unloading of munitions launch pod containers. 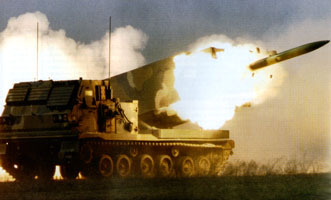 The MLRS M270 Launcher, a derivative of the Bradley Fighting Vehicle (BFV), is the standard U.S. Army platform for firing surface to surface artillery rockets and missiles. The Armored Vehicle Mounted Rocket Launcher (M270) is a full-tracked, self-propelled launcher/loader designed to launch 12 tactical rockets and re-deploy before enemy determination of launch position (shoot and scoot). The launch platform is also used to launch the Army Tactical Missile System (Army TACMS) and is capable of launching all M270 Family of Munitions (MFOM) tactical rocket/missile variants. The launcher consists of six rockets, each of which are mounted and controlled in both azimuth and elevation. It has an automated control system for aiming that automatically corrects for launcher cant and ambient temperature, a directional reference system to obtain azimuth elevation and cant angles, and a FCS which is operated from a man-rated vehicle cab. The launcher platform structure provides a "self-loading" capability. The M270 launcher has a maximum speed of 64 Km/hour, with a maximum range of 435 Km. It is capable of climbing a 60 degree slope and a one meter wall. Ordnance options include the MFOM (all variants of the MLRS rocket and Army TACMS missile). The M270 can load, arm, and fire a 12 rocket ripple within ripple within five minutes. M270 launchers are deployed three per battery and 29 per battalion. The M270 launcher can be configured for transport by Air Force C-141 aircraft on a limited basis. The M270 launcher is also transportable by Air Force C-5 and C-17 aircraft. MLRS consists of a self-loading launcher with an onboard fire control system (FCS). The launcher is mounted on a mobile track vehicle that carries 12 rockets or 2 Army Tactical Missile System (Army TACMS) missiles, which can be fired individually or simultaneously. Rockets have a range beyond 30 kilometers, and the Army TACMS Block IA missile can reach to 300 kilometers. The M270 MLRS, or SPLL (Self-Propelled, Loader / Launcher), is made up of two major units and an electronic fire control system (FCS). The SPLL is a mobile, self-propelled, self- loading, multiple launch rocket firing unit. It provides mobile long range artillery rocket support for ground forces. The M993 Carrier Vehicle and the M269 LLM are the two major units that make up the MLRS. The FCS is a computer control system, with a built-in computer and memory system. The SPLL has a cruising range of 300 miles at speeds up to 40 miles per hour. The total MLRS weights approximately 52,990 pounds. The second multiyear procurement contract for FY89-93 was awarded in July 1989 for MLRS. The US initial operational capability for MLRS was achieved in 1983. Starting in FY89, MLRS has been coproduced by the United States, United Kingdom, Germany, France, and Italy. As of September 1995, a total of 857 launchers have been delivered, 772 to the active Army and 185 to the National Guard.